Jenell Krishnan is a doctoral candidate specializing in Language, Literacy, and Technology (LLT) at the University of California, Irvine. She has served on several projects as a Graduate Student Researcher including Digital Scaffolding for English Language Arts and the Modest Supports for Sustaining Professional Development Outcomes over the Long-Term. Currently, her work focuses on online collaborative writing in middle school where she collaborates with English Language Arts (ELA) teachers from New York State and southern California to identify ways to support student-groups through formative assessment. Some of her work has been published in the Journal of Adolescent and Adult Literacy and has been presented at the annual meetings for the American Education Research Association (AERA), Institute of Education Sciences (IES), Literacy Research Association (LRA), National Council of Teachers of English (NCTE), and the International Society for Technology in Education (ISTE). She is the recipient of the 2017 AERA Writing and Literacies Special Interest Group’s Graduate Student Paper Award and a National Writing Project Fellow. Prior to entering the doctoral program, she taught ELA at the secondary level in a Title 1 public school and English Composition II at the college level in New York State. 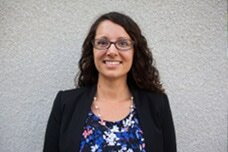 Her research interests include emerging technologies that support secondary students’ literacies, teacher professional development, and research-practice partnerships.